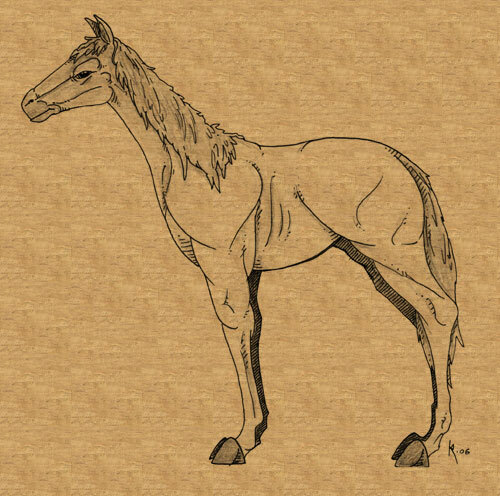 An elven forest steed is a rare animal, closely related to the horse. Typically only 1.2 meters (4 ft) high at the shoulder, these animals have silvery-white coats, silver manes and slim bodies. They travel very swiftly and silently through the forest. They are very intelligent and can be trained to respond to a dozen spoken or gestural commands. Elven horses are very fast, silent and sure-footed in the forest. They can easily gallop across the most treacherous footing, be it a fallen tree or the stones in a river. Because of their slim bodies and smaller stature, they can fit though small spaces where a regular horse cannot go. Elven horses are always found living with elves in elven forest communities. The animal's natural habitat is the deep forest. They are almost never encountered outside of deep forests or elven communities. Generally speaking, elven steeds look, act and interact with their environment like normal horses.